On-the-beach public relations for birds! On the Gulf coast of Texas, many Least Terns find protection at Bolivar Flats, an Important Bird Area near Galveston. In 2012, the terns benefited from some extra help. Houston Audubon and American Bird Conservancy posted an intern there as sort of a personal representative for the Least Tern colony. Since the nests and chicks are on the ground, they risk being crushed by vehicles, eaten by dogs, and disturbed by walkers. The intern spoke to many of the beachgoers. He offered them a view of the nesting terns through his binoculars, and explained how visitors might enjoy the wildlife sanctuary while helping provide the terns a safe haven. On the Gulf coast of Texas in August, young Least Terns are about to fledge, soon to strike out on their own for coastlines along Central and South America. [Least Terns calling] These petite seabirds are just nine inches long and weigh only one and a half ounces. They were once used to adorn ladies’ hats, but today many find protection at Bolivar [BALL-i-ver] Flats, an Important Bird Area a few miles up the coast from Galveston. 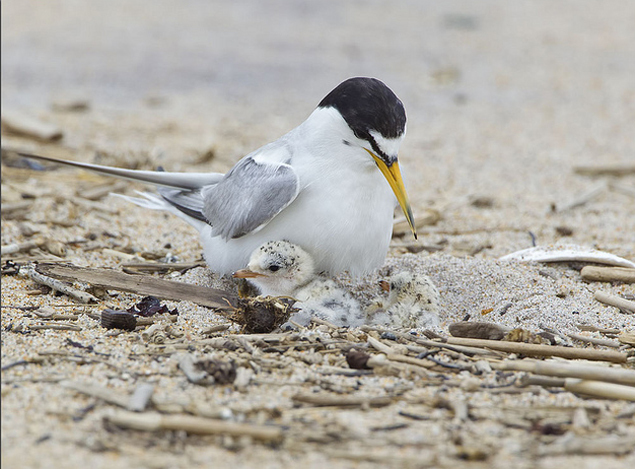 This year, the Least Terns benefited from some extra help. Houston Audubon and American Bird Conservancy, or ABC, posted an intern at Bolivar Flats to serve as sort of a personal representative for the Least Tern colony. Since the nests and chicks are on the ground, they risk being crushed by vehicles, eaten by dogs, and disturbed by walkers. The intern not only monitored the terns’ nesting efforts, but spoke to many of the beachgoers. He offered them a view of the nesting terns through his binoculars, and explained how visitors might enjoy the wildlife sanctuary while helping provide the terns a safe haven. And it’s not just Least Terns that may benefit from this on-the-beach public relations. Bolivar Flats is also a migratory stopover for hundreds of thousands of shorebirds each year. Join us at birdnote.org to learn more. Sounds of the birds provided by The Macaulay Library of Natural Sounds at the Cornell Lab of Ornithology, Ithaca, New York. Frenetic-sounding Least Terns 136274 recorded by M. Fischer and Least Terns 31511 recorded by O. Hewitt. Flock of Dunlin 59435 W.W.H. Gunn. Waves from the Gulf Coast provided by Kessler Productions. The Gulf Coast Bird Observatory helps birds!